5793 labyrinths found. Showing 4661-4680. Sorted by country, state, city, then zip/postal code. Painted on wooden floor. It is open to the public every first Thursday of the month from 7:00 pm - 9:00 pm. 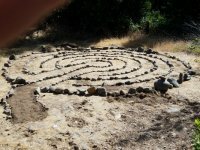 It will also be open on World Labyrinth day, May 5th 2012, from 10:00 am - 2:30 pm. The Labyrinth is installed in the large backyard of the property, most easily accessed from 54th Street. 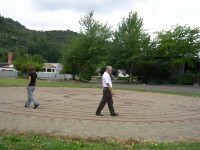 The Labyrinth is located in the east parking lot, the entrance to the location faces SE Stark at SE 47th. Sunday's the lot is in use for Church Services, any other day the Labyrinth is open to the public. 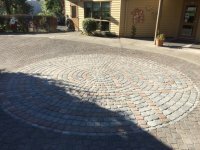 This labyrinth is the centerpiece of a painted intersection in a residential neighborhood. The Labyrinth is located on the Upper Level Garden which is accessible by elevator. See The Grotto website for Hours of Operation and the Elevator/Admission fee with discounts for Seniors (55+), Military (active & veteran) and children. See the website for hours as they vary throughout the year. At the corner of Cedar Hills Blvd and Park Way, a short way south of Hwy 26 (Cedar Hills Blvd exit). While the labyrinth is not really wheelchair-friendly, the path from the parking lot to it is. There is a bench and water fountain near the labyrinth and it is surrounded by trees and gardens; a quiet place for reflection. 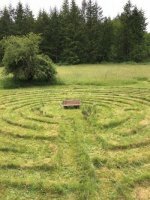 The labyrinth is available in the parish hall every fourth Sunday, from 6-9 pm, and on special occasions such as New Years Day and Holy Saturday. Near Lloyd Center, off NE Weidler Street. The labyrinth is in the NE corner of the balcony garden area of the 7th floor of the Kohler Pavilion, Center for Women's Health. If driving, you may park in patient/visitor garage for Kohler Pavilion, and take the elevators to the 7th floor, then exit the building to the balcony. This labyrinth is visible from the OHSU tram as well. This labyrinth is meant to be for healing and meditation, with the pattern made from engraved gingko leaf pattern blocks. Each leaf is engraved with the name of the generous donor who supported the building of the labyrinth. The labyrinth is accessible from the street level ramp or stairs off of Sam Jackson Park Road, and isn't blocked off at any certain time, however in general the building elevators are closed at 10pm and re-open at 6am every day. 4 Miles East of town center on HWY 26; turn right and park at #409. Based upon the 'Man in the Maze' Native American design seen in basketry and silverwork. Chartres replica, mowed in pasture. 46 N° Lat. ; 122 W° Long. Go downtown coming from I-5 and turn left at the Baptist Church. Enter the Rogue River Greenway in the City of Rogue River and walk 0.9 miles. The labyrinth is on the left side of the path. Can also be accessed from Valley of the Rogue State Park. From I-5 take exit 124, marked "City Center and Diamond Lake." Follow Harvard Avenue west 0.8 of a mile to the Church. The church is on the left hand side of the street (south side) and sets back from the road. Look for the church sign. If you come to Stewart Parkway, you have gone too far. access through doors off Marion and Winter street. Available World Labyrinth Day, May 6th 2017, from 10 am. to noon, also Wednesdays during Advent and Lent, throughout Holy Week.